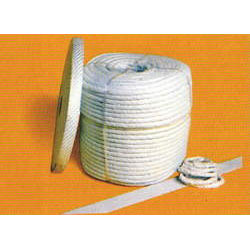 We are a leading Exporter of ceramic fiber braided packings from Ahmedabad, India. We are a renowned name, which is engaged in delivering an unparalleled range of Ceramic Fiber Braided Packings. The offered range is designed and developed utilizing high grade raw material and latest machinery in adherence with the industry laid norms and standards. Along with this, the offered range is tested utilizing advanced machinery and sophisticated technology in adherence with the highest quality norms and standards. Looking for Ceramic Fiber Round Braided Ropes ?